Before you can reference a work you need to know what reference type it is. There are quite a few different reference types, but most of the time you will be referencing either books, book chapters, journal articles or web pages. On this page, examples of where to locate information for refererences are highlighted. Match the numbers to the lists to learn what each piece of information is. If you need any further help, please Ask a Librarian. To decide if the work you are looking at is a book, look at the pages just after the title page. If you see a publisher and an ISBN, and none of the chapters have separate authors listed, then reference it as a book. Then follow the format for referencing a book. Pears, R. 2016, Cite them right: the essential referencing guide, 10th edn, Palgrave Macmillan, Basingstoke, UK. 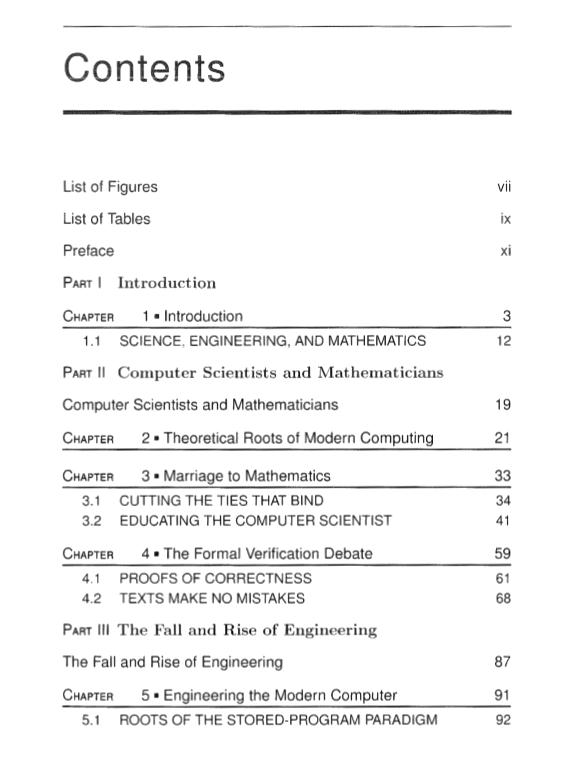 In this example you will notice that the table of contents displays no additional authors - this is one way to determine that the book is not an edited book. 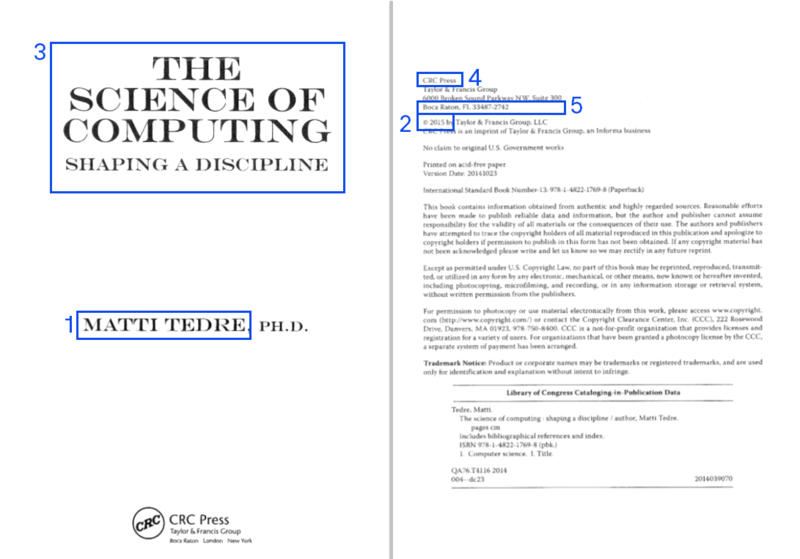 Tedre, M. 2015, The science of computing: shaping a discipline, CRC Press, Boca Raton, FL. If the item you are looking at has an ISBN but also has chapters written by different authors, please see the next section on book chapters. Some books are not written by a single author, instead they have an editor or editors who commission authors to write chapters in the book. Thus we have two different sets of people who need credit for their work – the authors that go with the title of their chapter and the editors that go with the title of the book. Then follow the format for referencing a chapter in an edited book. 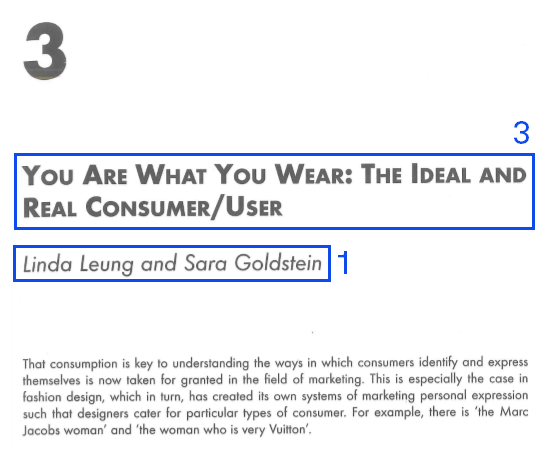 Leung, L. & Goldstein, S. 2008, 'You are what you wear: the ideal and real consumer/user', in L. Leung (ed. ), Digital experience design: ideas, industries, interaction, Intellect, Bristol, UK, pp. 25-34. Journal articles are short pieces of research written by one or more authors, which are then published in a particular volume, and usually an issue, of a journal. If you are looking at a reference that has a DOI, or has a volume or issue number such as 6(2) or 6:2 then you are looking at a journal article. Then follow the format for referencing a journal article. Booth, M., Schofield, S. & Tiffen, B. 2012, 'Change and our future at UTS Library: it's not just about technology', Australian Academic & Research Libraries, vol. 43, no. 1, pp. 32-45. Martela, F. & Steger, M. 2016, 'The three meanings of meaning in life: distinguishing coherence, purpose, and significance', The Journal of Positive Psychology, vol. 11, no. 5, pp. 531-45. Chao-Chen, L. 2013, 'Convergence of new and old media: new media representation in traditional news, Chinese Journal of Communication, vol. 6, no. 2, pp. 183-201. If you are looking at a reference online and wondering if it is a webpage, look to see first if it meets the criteria for a book, book chapter, or journal article, if it does, reference it as those types and not as a webpage. If it is none of these reference types then it is likely that it can be referenced as a webpage. Year the web page was created, if the year is not found, use n.d. Date you viewed the webpage. Then follow the format for referencing a webpage. Australian Bureau of Statistics 2018, Recorded crime - victims, Australia, 2017, cat no. 4510.0, ABS, Canberra, viewed 13 March 2018, <https://www.abs.gov.au/ausstats/abs@.nsf/0/DA3DED213BAE8114CA257178001B6949?Opendocument>. If you have logged into a website with your UTS logon (as indicated by the word ezproxy in the URL) then you should use the database rules when creating a reference. The database format is like a website, but instead of placing the URL in angle brackets you place the name of the database. This is because the URL would not be accessible to anyone who does not have a UTS logon. DatAnalysis Premium 2019, Fatfish blockchain limited, company report, Morningstar, Sydney, viewed 13 March 2019, <DatAnalysis Premium> . If you find a PDF online and it is not a journal article or behind a UTS login, then you can reference it as a website, but you can also cite the page numbers in-text, as you would for a print resource. 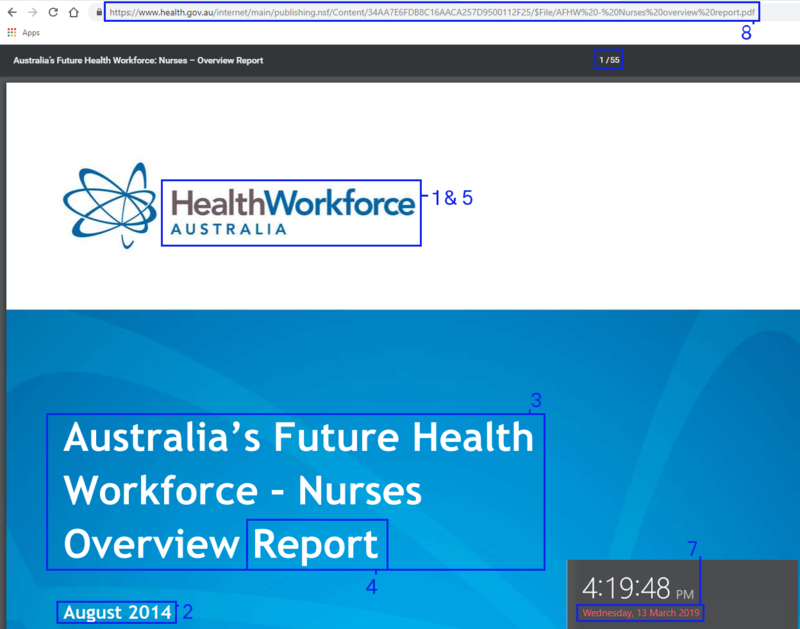 Health Workforce Australia 2014, Australia's future health workforce - nurses overview report, report, Canberra, viewed 13 March, <https://www.health.gov.au/internet/main/publishing.nsf/Content/34AA7E6FDB8C16AACA257D9500112F25/$File/AFHW%20-%20Nurses%20overview%20report.pdf>. If you need any further help, please Ask a Librarian.